Articles discussing climate change and global warming. Climate change has negative impact on forests from many different angles. The increased temperatures are not only causing heat stress and drought but they are also opening the door for wide-spread insect infestation. In many parts of the world researchers are already talking about rapidly growing forest mortality. Not all tree species are affected the same with some species of trees being more resistant than other, with other likely to be hit particularly hard, depending on factors such as age or sizes of trees. 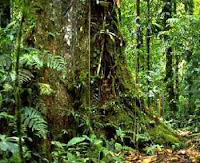 Some researchers fear that in business as usual scenario many forest areas will cease to exist and will turn into grasslands or some other ecosystems. This could further increase climate change impact because forests are large carbon sinkers, absorbing plenty of CO2 from the atmosphere. Also, the decomposition of dead trees releases CO2 in the atmosphere, therefore increasing global warming effect and debris from dead trees could also increase a forest's fire risk and result in even more CO2 emissions. Forests play vital role in not only absorbing CO2 from the atmosphere, but also in regulating climate and water purification. They are also important for water and nutrient cycle, not to mention that they also provide homes for thousands of different animal and plant species. In United States, this summer's severe drought has taken heavy toll on forests, and we are yet to receive official data about the total damage done to U.S. forests. One thing is sure though, there will be plenty dead trees in the final report. Many researchers believe that one-dimensional approach may not be enough to save our forests and are calling for joint action that would not only include climate change scientists and ecologists but also, biogeochemists, hydrologists, economists, social scientists, etc. Current forest management practices won't be enough to save many of our forests from climate change impact and this is why this issue needs to involve more scientists, from different scientific fields. Why new climate change deal is nowhere to be seen? How serious is the sea level rise threat? How much does deforestation contribute to climate change? What is required cut in carbon emissions? How long will global warming last? Global warming - Only science can save us?